The FLAT CAP REAR zips onto the back side of any module to complete that module and to give extra storage. The FLAT CAP REAR is designed to be attached to, and finish, the exposed rear surface of any module. The FLAT CAP REAR is 13.5" x 10.5". The FLAT CAP REAR module offers two flat pockets on the outside, and one flat half-height slip pocket on the inner surface of the module. 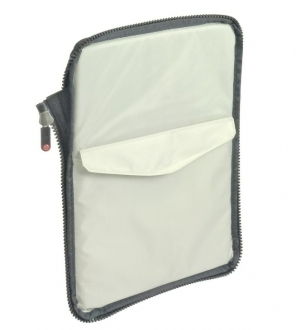 The primary outer pocket is accessed from the top and has a cover flap that is secured with Velcro. 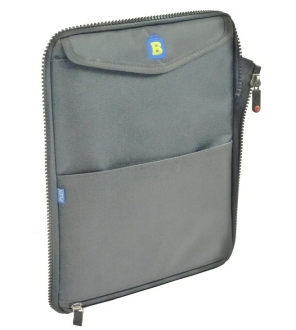 This where you'll likely store your iPad (as long as it's not in a thick case), or a manilla folder or two for some documents, or a magazine. There is a second flat half-height panel on the outside surface of the first one, that has a zipper across the very bottom. 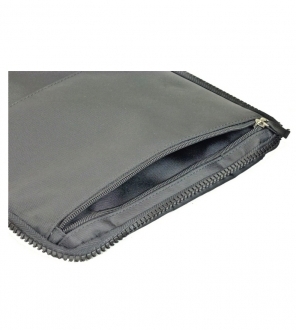 If the zipper is closed then this half-height panel acts like a pocket. If the zipper is open then the opening at the bottom allows the telescoping tubes of a suitcase or folding cart to pass through and the panel serves to secure your bag to those tubes (especially when this FLAT CAP REAR is attached to other modules to form bigger bags like the B2 COMPUTE, B4 SWIFT or the B7 FLIGHT. There is also a flat half-height slip pocket on the inner surface of the module. It has a cover flap secured with a spot of Velcro. Here you can stow an important document or two, or any small flat item that you'd like to keep out of harm's way. NOTE: The FLAT CAP REAR is one-directional (as are ALL of the FLEX System modules). It is always rear-facing. That means that it can only be zipped onto the REAR SURFACE of any module. You cannot zip a FLAT CAP REAR onto both the front and the rear of a center section. The good news is that there is an identical-looking, yet opposite version, which is called the FLAT CAP FRONT. This opposite modules is always front-facing, so it will zip on the the front surfact of any module. The idea is that if someone wanted to, they could put a FLAT CAP onto both the front AND the rear of a configuration, thus giving a nice slim look to the bag.